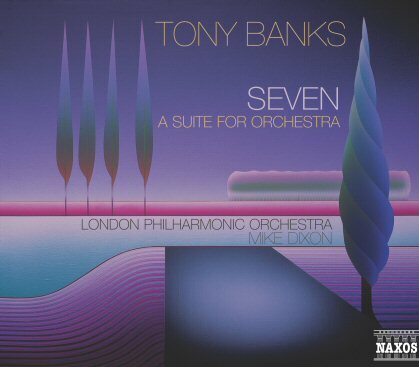 I recently had a wonderful evening at the Groucho Club in Soho at the launch party for Tony Banks’ new classical album – ‘Seven’. Tony was present and gave possibly the world’s shortest speech before returning to mingle with the guests for the evening. The party was a fairly informal affair with plenty of wine doing the rounds. Tony seemed in high spirits with his glass of red in hand and expressed his pleasure, now that he had finally completed one of his life long ambitions. Also present was Nick Davis with whom I had the pleasure of chatting to for quite some time. He was happy to discuss the forthcoming Lamb SACD, websites, future DVDs and skiing! I also met with a guy who has expressed an interest in playing ‘Seven’ live. Apparently Tony has been quite receptive to this so we'll await with baited breath. As you are probably already aware, 'Seven' consists of seven pieces of music, written by Tony and performed by the London Philharmonic Orchestra. This project has been a long time dream of Tony’s and contains two pieces of music that he wrote some 20 years ago. That said, the bulk of the suite was written in the past three years, specifically for this project. When I first read that pieces had been written some significant time ago, I was mildly concerned that these pieces would ‘stick out’ and would not gel with the more recently composed pieces. However, on hearing the album, my fears were laid to rest. The album flows through the seven tracks without a sore thumb in sight. The album itself comes in at just under an hour, starting with Spring Tide, a quiet and unassuming piece which to me is often slightly reminiscent of Ravel’s Bolero. The piece goes through several phases and at times has a quite dramatic quality. Black Down begins as a rather pastoral piece, which rolls into a heavily stringed section that certainly would not seem out of place in a film score. It evokes thoughts of rolling green fields across the English countryside that suddenly come under a dramatic change in weather to a rather stormy, turbulent tempo. We then experience the calm after the storm as the music returns to its earlier pastoral theme. The Gateway is the first piece that was not written specifically for this project. I find it noteworthy that during the heady 80s, when Genesis were enjoying their peak success across the globe and playing to huge concert audiences, Tony was also writing music that is so wildly different. Unlike most other pieces in this suite, The Ram starts as it means to go on. A powerful start continues throughout with an up-beat tempo, quiet middle section and then returns with a crescendo of horn and string. Earthlight is probably the piece that reminds me most of a John Williams type of film score that wouldn’t be out of place in a film about a small alien that comes to Earth and then has to phone home. Having enjoyed that film score as a child, I found this piece reminded me of my ‘younger’ days. Neap Tide is the second older piece of music and was written and originally recorded around the time of Strictly Inc. It is certainly possible to hear how Island In The Darkness from Strictly Inc. was influenced by Tony’s yearning to write classical music, something that I had never noticed before. The final track, The Spirit Of Gravity, explores several musical styles and again, parts of this piece could easily fit into a film score. In the words of Tony himself, it "travels through a number of different musical ideas only to end up finally just where it began." I have to admit that the album did take me a few listens to get into, this in itself is nothing unusual for me, I find it with most albums. I have always enjoyed classical music, but haven’t listened to any for a long while. Since listening to this though, I am encouraged to go and dig out my tapes of other classical composers. I have thoroughly enjoyed this musical journey and would be happy to recommend this album to any one who fancies broadening their musical horizons a bit. Go on, it’s only a fiver! I and I’m sure most fans, will wish Tony the best of luck with this album, a brave release in a world of classical music snobbery. With many thanks to Tony Banks, all at Naxos and specifically Philippa Green for her enthusiasm and for making this review possible.